What does this mean for me? Well, I joined a team – pretty respectable team of amazing spinners, the Sweet Georgia Yarns team, and I don’t want to let them down. 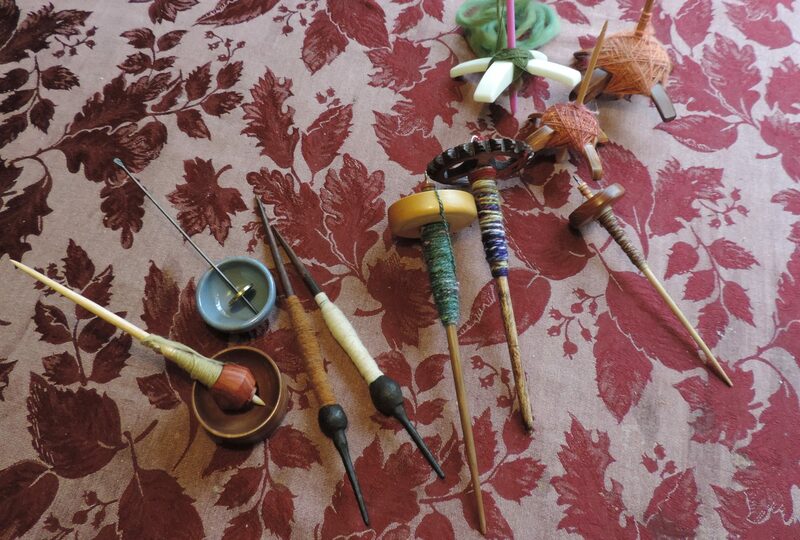 I work full-time so will have to cram in my spinning time in the morning and after work – combined with spindle spinning over the lunch hour. So this last while I’ve been getting ready. I don’t know how much I will need for an entire week. I know that during demonstration events when I just sit there and spin, I can easily spin 100g in about 4 hours. All of this depends on the fibre of course. Some fibres are tricky to spin and take more time – others spin easily and create great yardage – which is what matters in this contest. So here at the base of my Ashford Joy is about 3.5 lbs of delicious fibres all ready for spinning. In the next week, I may even draft out some of the braids so no time is wasted. I am part of a great team and I really don’t want to embarrass myself at the end of the week. So I have to get ready. One week still it starts. . . . . . This entry was posted in spinning, Spinzilla, Sweet Georgia Yarns on September 30, 2013 by DianaTwiss. Saturday was a day devoted to the flax, in all its various stages. The flax from bed #3 had fallen victim to the heavy rain we had last week. A lot of it fell right over. I tried to prop it back up, but the rains kept coming and the weight of the water won out in the end. So I pulled them. It was a larger bed than I originally thought so it took a while. Also, the rains had really saturated the soil so knocking the dirt from the roots had me looking like a mud-wrestler in little time. Here’s the empty newly harvested bed with all the bundles of flax on the ground. I have to move these to a better location so they can dry. But it was easier to just pull, knock the soil off and toss. Here’s the final bed. It was planted the last and you can see it’s still flowering. I am up to my eyeballs in flax, not sure what I’ll do with this bundle. Here’s the product of beds #1 and #2, newly retted. This flax is very different from the variety I grew last year. This flax has thicker stalks and is twice the length. I ended up borrowing a much larger kiddie pool from my neighbour, seen below. I was able to get all the flax into this pool. And here it is as the rotting/retting process starts. Lovely bubbles from fermentation. Unlike last year’s variety, this stuff really floats so I had to place my smaller kiddie pool on top and filled that with water to help weigh it down. We had some warm and damp weather over the week so this stuff retted in record time, just over a week. And even though I regularly changed the water and added new stuff to it from the rain barrel, it smelled to high heaven. It was a fishy, swampy, stale beer kind of smell. And strangely enough, one that didn’t readily wash off. You had to scour yourself with soap and water to get the smell out. My over enthusiasm to get it all into the same pool was nearly my undoing. It retted fast and thus had to be deal with fast. All of it. So on Saturday, after harvesting the flax on the other side of the house, I had to rinse and scrub this flax to get the smelly rotten bits out of them. The linen was fully exposed and if I had left them in the water for much longer, the linen itself would be compromised. To do that I had to bail all the water out of the pool. Once nearly empty I could tip it and further drain the flax. I placed it on a tarp and grabbed the hose. Using the jet blast I thought I could just rinse it out that way. But there’s so much of it and it’s so dense, the linen fibres really take up space, I needed more action to rinse it out. So I filled the pool with clean water and bundle by bundle I put it in the clear water and squished and squeezed until it didn’t feel slimy any more. After about five bundles I had to empty the pool and start with fresh water. Which suited me just fine because by this time my back was hurting and I was seriously questioning my passions. Here it is all newly washed and drying against the back fence. And here’s a close-up. You can see the linen fibres all over the place. These bundles still smell a bit more swampy than I like. I wonder if that means they haven’t retted enough. Or if I simply haven’t rinsed them enough. I’ll see what they’re like when they are fully dry. If they still smell I am going to take them down to the Fraser River and wash them there. That will be much easier than filling a kiddie pool over and over and over again. Of course the fishers may wonder why I am washing straw in the river. And if they still smell after that, I’m just going to throw them on the ground and let the rain take care of them. This entry was posted in flax, harvesting flax, retting flax on September 9, 2013 by DianaTwiss. Here’s a quickie post to show you my latest strategy for retting flax. Last year I retted the flax in rubbermaid containers, but the variety of flax that is grown for linen is a much taller plant. Nearly twice as tall as the flax seed variety. So I needed something larger. I settled on a kiddie pool from Canadian Tire for $12.99. This kiddie pool fit about a 1/4 of what I have from beds #1 and #2. Unlike the flax from last year, this stuff really floats so I have to weigh it down with rocks. Here’s the whole lot of it. I still have two more beds to harvest, dry and ripple so I have a lot to experiment with. I just may experiment with dew retting just to get a sense of how that works and what the result will be. Somehow I think that wet retting gives me much more control cause I can quickly see what’s going on. With dew retting, you simply put it on the ground and let the dew and natural molds and mildews rot the pectin layer that holds the fibres in place. Will keep you posted. My own energy level may be the deciding factor. This entry was posted in flax, retting flax on September 1, 2013 by DianaTwiss. The Fort Langley National Historic site is a former trading post of the Hudson’s Bay Company. This past weekend they had a series of events focused on the homesteading aspect of running a trading post. They had events that taught people how to make butter, how laundry was done before Maytag, preparing and cooking bannock, and washing wool and spinning fibre, just to name a few. Here’s a “before” photo of the fibre. It actually looks better than it is. It is greasy and full of dirt. So much that the dark colours of the fibre are not actually true. Look at the “after photo. When all the lanolin and dirt is out of the fleece you can see that it’s much lighter in colour. And the browns are also lighter and not a chocolatey in colour. The fleece is a locally sourced Jacob. It’s a kind of sheep that has many colours on its coat. After the washing demo we went up to the Big House and showed the kids (several dozen of them, what were we thinking?) how to card wool. Then we spun up their wee rolags and made miniature skeins for them. I think it was a good program because I exposed the kids to the whole process. It also showed them the role they would have had to play in yesteryear as carding was a job that children did. The only problem with the day was my costume. Here it is, and yes, let’s a pretend that I have such a svelte waistline. Good looking costume and it fit well. However, it was nearly 30 degrees in the Fort due to the full-on sunshine and lack of wind. The blouse is a poly-cotton and the skirt is a heavy weight 100% polyester. I was boiling and thanking my lucky stars that historical re-enactment only goes so far. If I had to have worn a corset I would have stabbed someone. As it was I survived by discreetly fanning the dress against my legs and cursing the inventor of plastic fabric. I’d do it again in a heartbeat, but next time I’m making my own costume. Thanks Fort for a lovely time. This entry was posted in Fort Langley Historic Site, washing wool on September 1, 2013 by DianaTwiss.